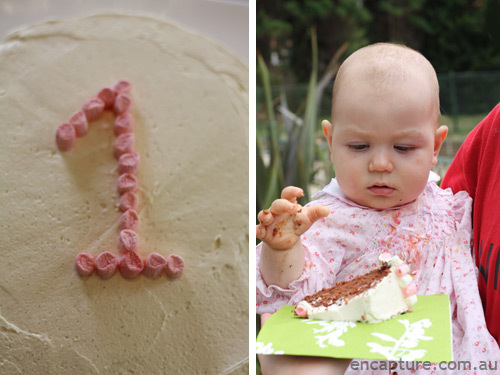 Baby Bondville turns One! Well, almost. Her birthday is actually 28th December, but as it's such a tough time of the year to get everyone together, I banded with my buddy Bron whose little boy is also just One and we hosted a wee party together at the park. It was a great, low-key way to share the day with friends, split the hard work, and the hosting. We're already planning to do the same for the number 2's! The cake! Melt and Mix Chocolate and Coconut cake from Donna Hay Modern Classics Book 2* with vanilla bean buttercream frosting from Donna Hay Kids magazine volume 7. My friend Bron provided the cups and I provided the retro striped paper straws (from Lark). Tablecloth from Dandi. Hydrangeas from our garden. 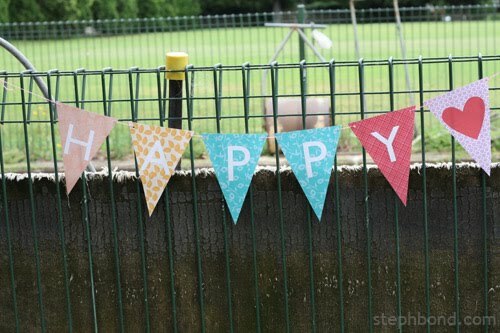 I just love this bunting. It's a printable (my new secret weapon), which means you can print the design on your own printer. 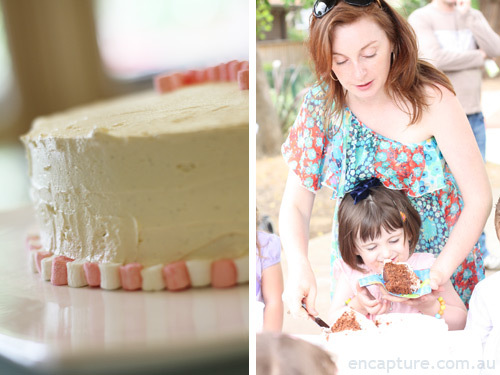 Download from the Ruffled blog (thanks Carolynn of Two Brunettes! ), choose the letters you want, print on your own printer, cut each letter out, hole punch the corners and string with baker's twine. Soooo easy. 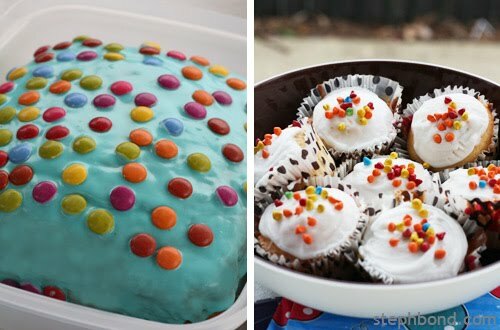 My friend Bron made the blue smartie cake which was so popular with the boys, and the matching patty cakes. 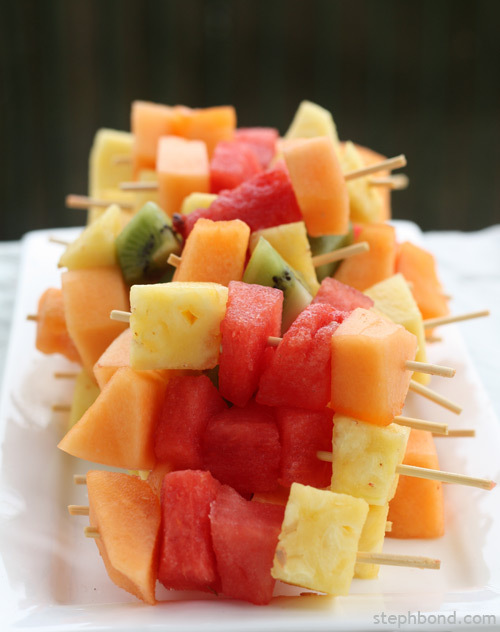 Fruit skewers courtesy of Mr Bondville. I think he did an amazing job. Super-sneaky chocolate brownies (laden with pureed spinach and carrot) from Deceptively Delicious* by Jessica Seinfeld and Bron's palmier-style cookies. 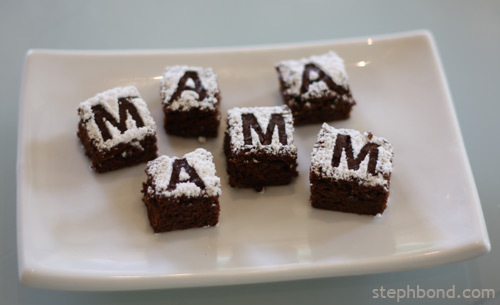 I used icing sugar to spell out the initials of the two birthday babies on the brownies. The cake! That's me cutting a slice for my big girl who is a fantastic big sister. The lovely birthday girl enjoying eating (and smearing) her food. Happy Birthday Bubby Bondville! What a beautiful party Steph! And I love your dress by the way, stunning! Happy upcoming 1st birthday to Baby Bondville!! 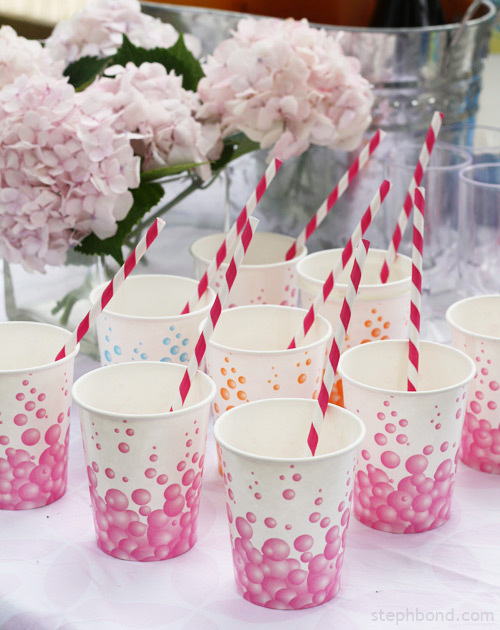 Looks like a great party - the bunting is super cute and I love the initialed brownies. Can't wait to see you Wed! Great party Steph! You and Bron did a fab job! Oh how beautiful!! 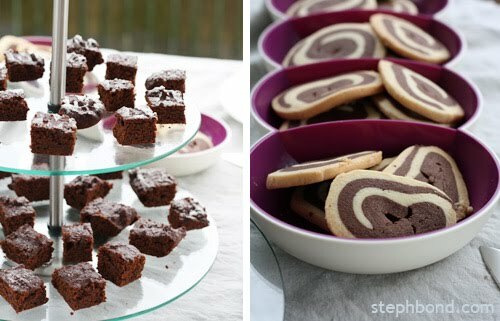 I love the brownie idea! 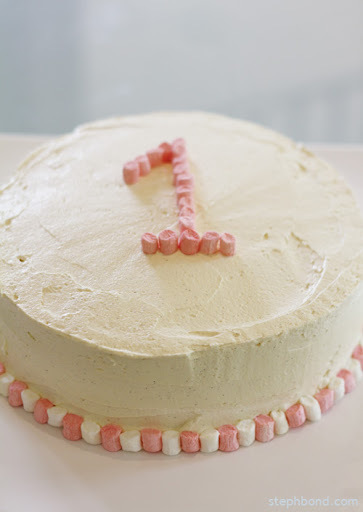 The pink cake is just gorgeous too. So is every photo! Thanks so much Annie, Selina, Ash, Betsy, Kellie, Amanda x 2 and Janette! A lovely low-stress day. Just waiting until she turns 3 and then we'll amp things up a bit!